Three men have been arrested over the murder of a man who worked on the BBC's Strictly Come Dancing, who was killed as he celebrated his birthday. Paul Gunner, an electrician, was marking his 32nd birthday when he was punched in Bexley, south-east London. Police think his attackers assaulted another man shortly before he was attacked outside a kebab shop in Bourne Road at about 01:00 BST on Sunday. 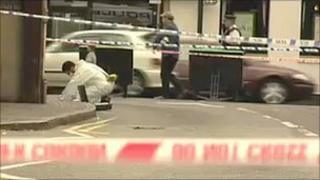 Three men aged 25, 31 and 32 are to be questioned by Metropolitan Police. The suspects were arrested on Sunday evening. Mr Gunner, who suffered injuries to the head after he was punched to the ground, was taken to a hospital where he was pronounced dead at about 02:30 BST. The victim of the earlier assault was not thought to have been seriously hurt but has not yet been identified. Det Ch Insp Caroline Goode, who is leading the investigation, said: "I am particularly keen to speak to the victim of the first assault as he may hold vital details which could help us identify the suspects." Mr Gunner was employed by the contractor Set and Strike and was involved in installing the set of Strictly Come Dancing at the BBC's Television Centre in White City, west London. He was "one of our top electricians", said company secretary Margaret Barker. She said he had "a lot of patience", and there was "disbelief that this has happened". Mr Gunner would normally have been working at the weekend but had taken time off for his birthday, she added. A BBC spokesman said staff were "shocked and saddened". "Our thoughts are with his friends and family," he added.